Inspired by (read: a complete rip off of) 10,000 Words’ recent Nostalgia post on US news websites, we’ve put together our own UK version. There was no way, with the great and patriotic event fast approaching, that one could simply do with linking to a post about American sites. They weren’t the only newspaper publishers to head out into the great frontier of the internet, we had our own Boones and Crocketts of the web, etc. etc. Sadly, online journalism’s latest frontiersman has prevented the Wayback Machine from crawling his sites. And a few, like Mail Online, are only indexed back to about 2008, which is no fun because they look pretty much like they do today. But here is a small selection, mostly from 2004, of the UK’s own pioneering efforts. 1. 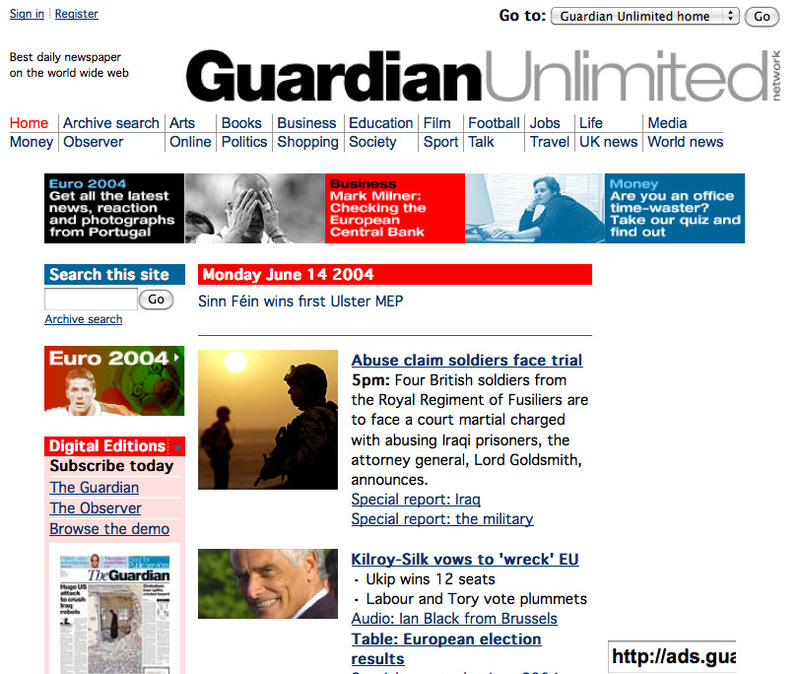 The Guardian, June 14 2004. Amazingly, the EU is still standing, despite facing the might of Robert Kilroy-Silk seven years ago. This entry was posted in Newspapers, Online Journalism and tagged internet publishing, Online Journalism, online news, the web on April 27, 2011 by Joel Gunter. Nicholas Carr has an interesting piece on Nieman Reports discussing the speed of news consumption online and the impact on journalism. According to Carr, “skimming” of news is a threat to serious journalism, which requires “deep, undistracted modes of reading and thinking”. On the web, skimming is no longer a means to an end but an end in itself. That poses a huge problem for those who report and publish the news. To appreciate variations in the quality of journalism, a person has to be attentive, to be able to read and think deeply. To the skimmer, all stories look the same and are worth the same. The practice turns news into a “fungible commodity”, he writes, where the lowest-cost provider “wins the day”. The news organization committed to quality becomes a niche player, fated to watch its niche continue to shrink. If serious journalism is going to survive as something more than a product for a small and shrinking elite, news organizations will need to do more than simply adapt to the net. They’re going to have to be a counterweight to the net. This entry was posted in Editors' pick, Online Journalism and tagged commodification of news, Nicholas Carr, nieman journalism lab, online news, web journalism on July 23, 2010 by Rachel Bartlett. BBC News Online was initially devised in 1997 as a response to CNN’s online news page, claims its creator and former Editor-in-Chief, Mike Smartt. Speaking at the University of Coventry as part of its ‘Coventry Conversations’ series, Smartt told of the early days of online news and the difficulties faced by both designers and journalists. Online journalism had to wait for technology to permit it to expand to its full potential, he said. Deadlines were demolished and journalists were regularly spending over half an hour to write a code with their story, only to have to go back again when a space, comma or any other character wasn’t in place. The BBC were very wary of going online at first, Smartt said. “Initially, in the BBC, the journalists rejected the idea for two reasons: the money that was used to finance it was obviously coming from radio and television, so there was some resentment, and the internet was seen, amongst the people in the more traditional media, as competition,” he confessed. He also spoke of the problem of deciding what a story should look like online, whether going on the internet meant that people were looking for “three Ceefax sentences” or something more in-depth. The BBC’s 1996 ‘Online News Concept’ outlined goals that are beginning to be met only recently: valuable text, high-quality pictures that load fast, high-quality audio, full screen videos and full interactivity. This entry was posted in Events, Online Journalism and tagged BBC, bbc news online, CNN, conventry conversations, mike smartt, Online Journalism, online news on March 18, 2010 by Teo Beleaga. Patience is a virtue when building a local audience. Yelp COO Geoff Donaker said it takes 18-36 months for a new Yelp site to reach critical mass with reviews, even with staff ‘on the street’ in every Yelp market. Yelp has nearly doubled its audience in the past year to about 11 million uniques per month. This entry was posted in Editors' pick, Events, Online Journalism and tagged interactive local media conference, mark briggs, online news, yelp on December 15, 2009 by Judith Townend.